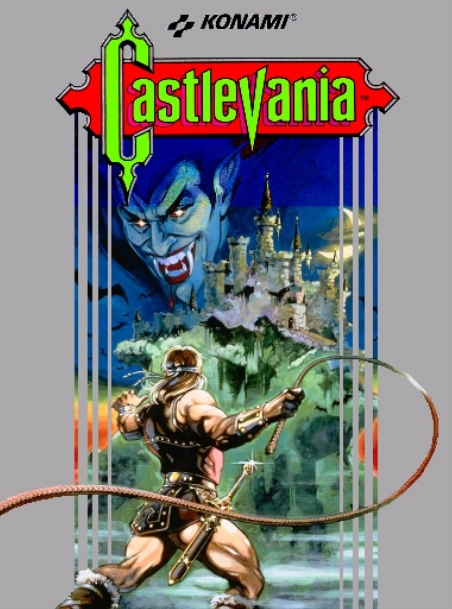 Castlevania (known as Akumajō Dracula in Japan) is the first entry in Konami's long-running franchise. While future games in the series would become known for helping define the Metroidvania genre, the first title was a more straightforward, linear 2D platformer. 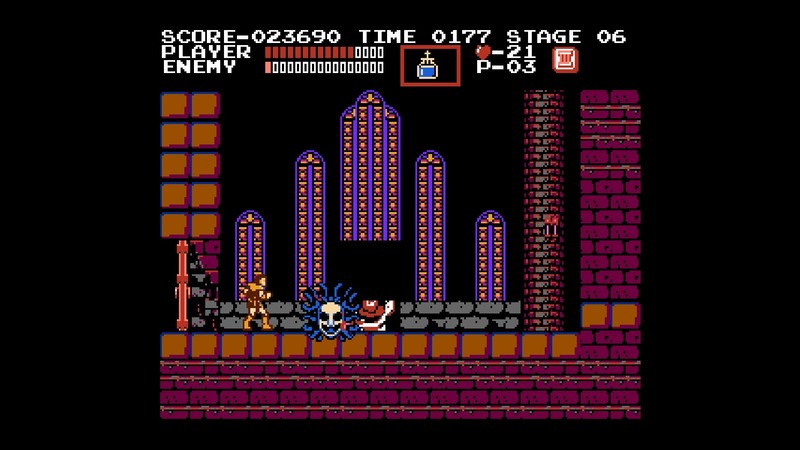 Often cited as one of the best games on the NES, Castlevania's legacy has endured well into modern times. It is no wonder that it is this specific incarnation of Simon Belmont that will be making an appearance at the most ultimate of smashes. @drahkon, @S.C.G, @Ike, @Vileplume2000, @Nicktendo have voted for this game, but anybody else is welcome to join... if you dare. P.S. : Just a quick disclaimer: the N-E VG Club is not a rigid event. Even those of you who have not voted or participated in the club until now can hop right into this month's game if you wish to do so. All we ask is that you share your thoughts and experiences with the rest of us. The first two levels were quite easy, but that's no surprise. Very few first levels are difficult. I think the difficulty will ramp up quite a bit soon, won't it? First impressions: Music is spectacular. I mean, even though I never played the game the song in Stage 1 isn't new to me. Such a classic and memorable tune. Dada daa daa, du du du du duu duu duu duduuu. Well, I'll definitely got that stuck in my head for a few days. I love how the game implements orange and blue. These complementary colours make Simon Belmont "pop". Everything is clear and vibrant which in turn helps make the gameplay feel even better. Speaking of which... No wonder Castlevania is regarded as one of the best NES games. It has a very unique flow. Run, jump, whip. So much fun. Looking forward to spending more time with it. Now it's time to sleep, though. I'll tackle level three tomorrow. I haven't died, yet. The third stage got me very close to losing a life, though. I reached the boss and was only allowed to be hit once...and I got hit once. Can't believe I never played this before...it's incredible. It's a shame that I missed out on the NES days, but that's what happens when you're born 3 years after its release in Europe. Yeah, it's very much like the Ghouls N' Ghosts series in that regard. It has a very deliberate pace and flow to it that makes it immensely satisfying. Not a lot of action games really get that right and not many seem to understand that limitations in the player's moveset can be woven into making a game more satisfying to play. A game like Castlevania simply wouldn't be fun if you had the same fluidity of movement as in, say, Super Mario World. Might be worth mentioning which platforms this game is available on. Castlevania is available on NES, GBA, Wii, 3DS, WiiU and the NES Classic. It's also on the PC through the Konami Collector's series. There's some adaptations on the Commodore 64, Commodore Amiga, and the Playchoice-10. They differ in graphics and sound, but the game layout is pretty much the same. There's some adaptations on the Commodore 64, Commodore Amiga, and the Playchoice-10. Thanks for the reminder! Completely slipped my mind for. some reason. Just edited the opening post. I've booted up my NES Classic to start this little piece of mischief today. I like the playstyle of it, and the lack of mobility of Simon. You really have to calculate your jumps, as you cannot easily change direction mid-jump etc. Makes sense for a guy carrying a whip and heavy equipment with him. Having to push in a diagonal direction to climb a stairs is also priceless. But the controls never feel unfair, and I think it's a game that you can really master. Soundtrack as said is amazing. I got up to world 4 (had to use a continue in world 3), and died there again so I gave up for now but I will push on! What I love about this as well (and a number of NES games do this) is give you power-ups in completely useless situations. I always get that Cross for example when there is no enemy in sight. Seeing as I already played this game a few times in a full screen before, I decided to buy the 3DS version for a change of pace. I managed to make a surprising amount of progress in two days. I lost a life as early as Level 2, and then again at the beginning of Level 3. I tend to get stuck in Level 4's boss, so I figured I'd use my first Continue there... but then something amazing happened. I made it to the end, entered the the last corridor to the boss with holy water in hand, I managed to spawn a "II" and a "III", both in a row in that one corridor, which allowed me to cheese the boss with the holy water! I think it's the first time I ever beat him without dying! Confident, I make quick work of Level 5, excited at the prospect of beating this game without using a Continue... and then I stupidly miss my cue at the boss, and he kills me. Without my trusty Holy Water, I ended up predictably Continuing With that shame in mind, I was sent back to the beginning of the level, saved some water, and cheesed the boss for the sake of some catharsis. There's something about this game that lends itself well to amusing stories. I think it might have something to do with the slower pace, makes you more attentive to your own actions and progress. I finished the game a couple days ago. Taking a break after beating Death may have been a mistake. Feeling rusty, I felt Level 6 is hard as balls, and I wasted a Continue on that level alone. Afterwards, I realized I completely forgot Dracula's rhythm. I even kept forgetting I needed to hit his final form in the face, too. I died time and time again. 4 Continues worth of lives, in fact. My aspirations of a Continue-less run feel laughable in retrospect. But boy, did it feel satisfying to finally topple the guy. This is a final boss worth slaying. All in all, it's still a classic, and I was very happy to play it again. I love the idea of this monthly game club and it’s given me a great excuse to play the original Castlevania for the first time! I’ve played the 3DS Virtual Console version and after a few hours I’ve now completed it. Well I finally managed to beat Dracula but didn’t go through it all again on the harder difficulty. It’s a decent enough game and if I didn’t already know, I would have guessed it to be a Konami game, with an art style very reminiscent of other Konami NES titles. By that I mean nicely detailed backgrounds and a main character using a colour palette that ensures they stand out. The controls are intuitive and simple and, like others have said, the whip is a satisfying weapon to use. Playing on the 3DS thank goodness for restore points! I always thought I was a decent player of platform games, but I’m not sure if I would have stuck through the game without the restore points, owing to the amount of deaths I took (mainly at the hands of the bosses and those frustrating floating Medusa heads who constantly managed to damage me back into a bottomless pit!). The deaths were always my fault though, and I’m glad I did keep going as I enjoyed the game as a whole, and I can see that it set up a solid foundation for future Castlevania games to expand upon. I’m looking forward to seeing what suggestions come up for next month now. Well, I completed World 4 without too much hassle. But then it became an uphill struggle! The part in World 5 with the Medusa heads and the Knights took me an insane amount of tries though. I must admit I used my NES Mini save state function a couple of times. It took me a while to find out that there's a sweet spot to stand still and the Medusas just fly over you. Death was fairly easy as I got to him with the boomerang and the III throws. I set my first steps in World 6 but quit at the part with the eagles and monkees (or whatever they are). I hope to at least kill Dracula this weekend! Started last night but played it most of today, just finished now. Played on the NES Classic and used save states. Don't think I could have finished it in time without them. I guess there's a way to inflict more damage on his first form if you hit him in the right place/right time? Most of the time I only did 1 peg, but sometimes managed to take off a big chunk. Good game, I think it still stands up well today. I hate the Medusa heads and Fleemen though. 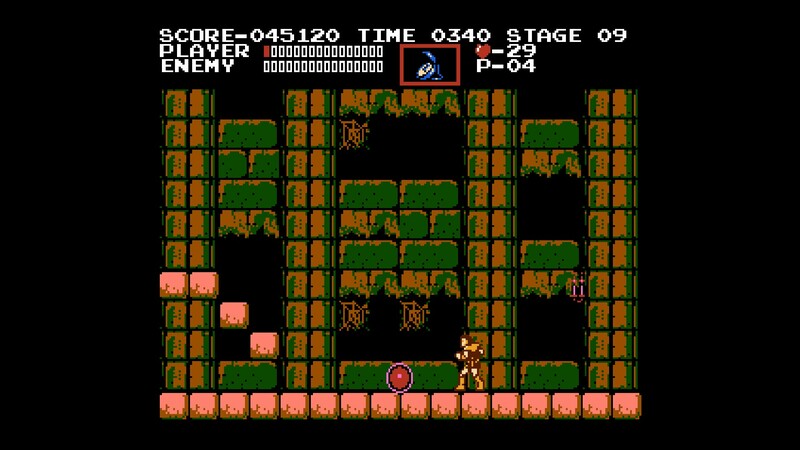 I think I prefer this style Castlevania over the "metroidvania" games, or at the least the ones I played. Coincidently (ooor was it???) Jeremy Parish did a Castlevania retrospective this week.